I’ve always wanted to grow an oyster or a clam or a scallop, to watch it grow from the size of a grain of sand, its distinct shell shapes only visible under a microscope, to the full-sized delectable treasure of the Peconic Bay. There are plenty of places around the Peconic Bathtub where you can learn a lot about aquaculture, but nowhere is more entrenched than the Southold Project in Aquaculture Training, at Cornell Cooperative Extension’s Marine Education Learning Center in Southold. 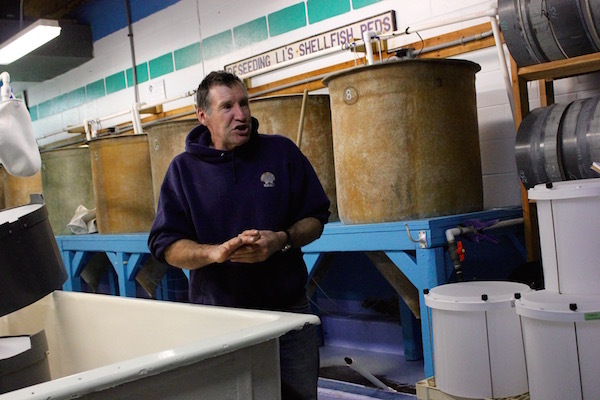 I first met Kim Tetrault, who runs the SPAT program, about a decade ago when the Sag Harbor Express asked me to write a feature story about his work teaching the public to grow shellfish. At the time, he was living just across Cedar Beach Creek from Cornell Cooperative Extension’s marine lab, and he showed off the projects he was working on in that lab with the enthusiasm of a little kid who had the coolest toys in the world just across the creek from his house. Well, this past Wednesday, when I attended the first of a year-long series of lectures on becoming a shellfish gardener at SPAT, it was great to see that Kim’s enthusiasm for his work hasn’t diminished, though his commute — he now lives in Springs — is longer than ever before. SPAT is not only an acronym for the community shellfish garden program in Southold, but “spat” is also the name given to baby shellfish at just the point where they stop floating in the water column and settle down to the spot where they’ll sit on the bay bottom, filtering our water and waiting for the rake or the dredge. Or, in our case, for the day when we pull our aquaculture cages up out of the water and take our oysters home to enjoy with a nice cold beer. More than 2,000 families have taken part in the SPAT program since it began 15 years ago. In the early days, said Mr. Tetrault at Wednesday’s lecture, each shellfish gardener was given 2,000 tiny baby oysters to nurture over the course of the season. But at the end of the program, you had to give half of them back. Now, each shellfish gardener is asked to care for 1,000 baby oysters, but they get to keep the ones that survive through to the end of the program. That said, growing oysters is, in and of itself, a very important task, and one that could really help the world. Mr. Tetrault said he reads new stories nearly every day about the creation of artificial oyster reefs to protect shorelines, and the value that oysters provide by filtering out contaminants in seawater. “Oysters can save the world,” he said. But with that great power comes a great responsibility. After all, humans can become very sick or die when they eat oysters whose flesh has accumulated serious levels of toxins, or have been contaminated by bacteria. The mothers of the algae cultures. And that all comes down to what it is the oysters are eating. Healthy oysters eat healthy algae, and that’s what’s growing here in the depths of January. There’s not much to do yet this time of year at the SPAT lab. Water from the creek has just begun to flow into the tank room, which is just being set up for the growing season. But very soon, this room will explode with life. 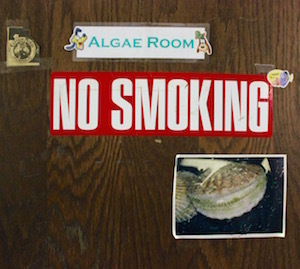 In the algae room, cultures of algae that are fed to the oysters are being kept alive, like a yeast mother, waiting for the moment they will begin to be fed to baby shellfish. And so, our first lecture of the season was all about algae. 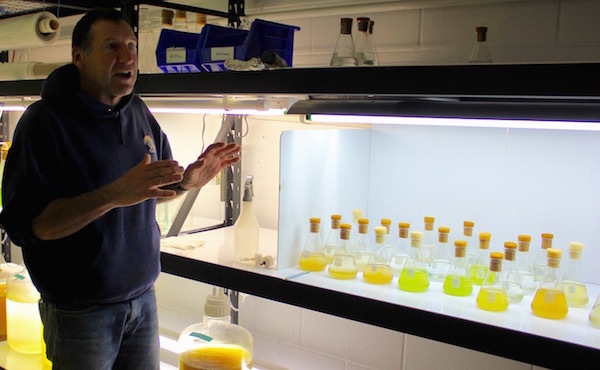 One shelf in the algae room was filled with Erlenmeyer flasks with foam stoppers, partially filled with several shades of bright green algae and golden-colored diatoms. Each of these varying shades of algae has been carefully cultured for years to provide just the right nutrients at just the right time in an oyster’s life cycle. The smallest celled algae, which is known as Tahitian Isolated, is called T-iso in the lab. It can be fed to the shellfish on day one. The larger-celled Tetraselmis is fed to larger shellfish. And a recently cultivated strain, Pavlova, can be fed to shellfish on day one and provides them with high-lipid nutrition that can cause scallops to set, on average, five days faster than with any other kind of algae. But Pavlova is not easy to grow. Batch cultures nearly ready for harvest. 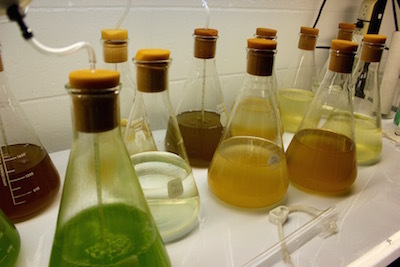 Each of these cultures is gradually transferred up to larger Erlenmeyer flasks, then to carboys and then to big tubes along the wall, until the culture reaches peak cell density and the tubes are drained and the algae is fed to our shellfish. Then the process is started all over again. 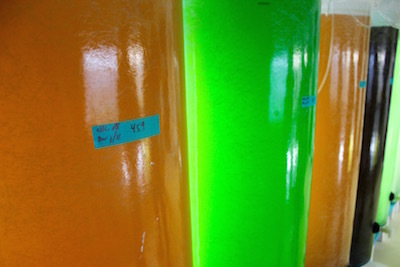 In the room behind SPAT’s algae room is a darkened room filled with the latest in algae culture technology. It’s going to be on line later this winter. This system, called SeaCAPS, is a series of giant heavy-duty plastic tubes, which look kind of like the tubes that are sometimes used to keep tomato plants warm when you plant them before Mother’s Day. The algae culture is fed into a closed system in this room, until it reaches a point where all the bags are filled. At that point, one drip of algae concentrate is removed from each bag just as another drop of sterilized sea water is added to these bags. It’s a system that could theoretically continue on into infinity. “There’s a huge potential for this machine for all types of things,” said Mr. Tetrault. He said those uses range from fueling cars and jet planes, to capturing the carbon in the atmosphere. But that’s the high tech side of things at SPAT. If you’re retired and looking to hang out with new friends every Monday, Wednesday and Friday morning while you sit on the dock of the bay checking up on your oysters, a lot of SPAT participants are here for that. Some take the initiative to build boats to be used in the program. One of SPAT’s alumni decided to throw a bunch of toys down in his oyster cage and then photograph what collects on them. SPAT lectures are held on the third Wednesday of each month from 5 to 7 p.m. and again on the third Friday of each month from 1 to 3 p.m.
SPAT isn’t the only place you can join a community aquaculture program on the East End. The Shinnecock Bay Restoration Program has an oyster garden, the East Hampton Town Shellfish Hatchery runs regular community aquaculture classes, and Southampton Town is working on a shellfish hatchery at Conscience Point. There is also a community oyster garden in Sag Harbor.